Last June a windstorm toppled about 1,800 trees in Minneapolis. Many of the fallen trees were in boulevards (the area between sidewalks and streets) rather than in yards. This raised concerns that recent sidewalk replacement—and resulting severed tree roots—had been a factor. Led by forestry department professor Gary Johnson, the lab studied damaged and undamaged trees along the storm’s path. The data set included 3,076 trees, of which 367 were total failures (tipped or partially tipped) due to the storm. “The major finding is that replacing the sidewalk increased the odds of root failure by 2.24 times,” Johnson says. 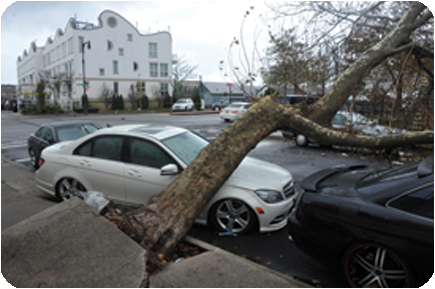 For example, when no replacement work was done, the average linden had a 10.6 percent chance of root failure; with sidewalk replacement, this increased to 21.0 percent. When combined with replacement work, tree species was also a significant factor. Linden trees were most likely to fail, followed by ash, maple, and elm. “Essentially, when replacement work was done near any one of these trees, the rate of failures more than doubled,” Johnson says. Read the full article in the June issue of Catalyst.